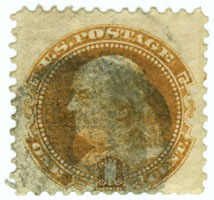 1-cent postage has head of Benjamin Franklin, after a bust by Houdon. 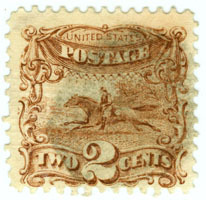 2-cent postage is of a Post rider and horse. 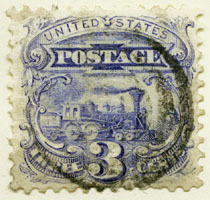 3-cent postage is a 4-4-0 wood burning locomotive. 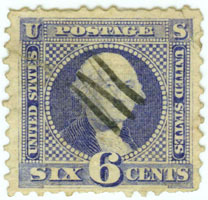 6-cent postage is the head of Washington, after a Stuart's painting. 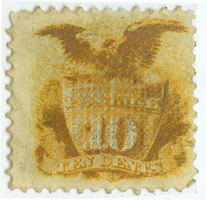 10-cent postage is a shield with an eagle resting with outstretched wings. 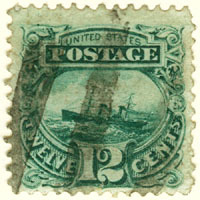 12-cent postage has the ocean steamship, the SS Adriatic, in rough seas. 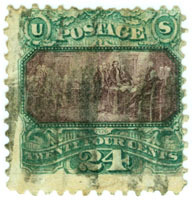 15-cent postage ( Type 1 - Type 2 ) represents the landing of Columbus, after the painting by Vanderlyn in the Capitol in Washington D. C.
24-cent postage represents the signing of the Declaration of Independence, after the painting by Trumbull in the Capitol in Washington D. C.
30-cent postage has an eagle on a shield surrounded by flags grouped on either side. 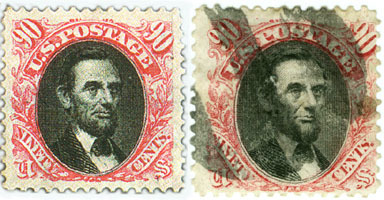 90-cent postage is a portrait of Abraham Lincoln, from a photograph. 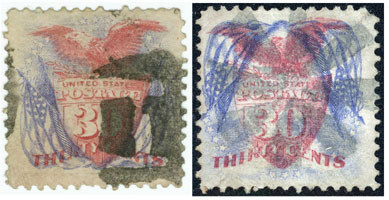 The designs were furnished by the National Bank Note Co, of New York with there bid, upon which a contract was entered into on the 12th of December 1868. SPECIAL NOTE: All except the 6¢, 10¢, & 12¢ are known to exist without grill and would sell for premium value.